but you don't need to go there...not for a burger...under any circumstances. 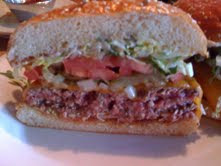 Let's lead off with---this was an all around crappy burger. Ready...Set...Terrible! This was just plain nasty, boys and girls. The patty, while cooked to a perfect Med Rare, must have been cooked with a steam wand, because this bland, GREASY mess had no sear to bind it or add the remotest hint of texture. It had the consistency of wet dog food, so it was downright unpleasant. It came on a cold, un-toasted bun that was chewy and spongy. It was accompanied with a gang of wet crap. They slathered this thing with everything: mayo, ketchup, and some sort of vermiform slaw, which brought to mind a fistful of pin worms. How about a fistful of raw, chopped, white onion? Yep, I got that, too. After I had scraped off the oily, wet gunk , I was left with a burger that was greasy as hell, and bland, bland, bland--no seasoning whatsoever. The fries--sort of interesting, but by accident--they must have fried some corn product in the same oil as the fries, so they tasted vaguely like a greasy, taco shell. Burger Review : If you like Father's Office, you will love this foul, nasty, wet mess.